The Photograph above falls under the popular "Look-up Photos" category. You can also explore the hashtag #lookup on Instagram or Twitter to get a better Idea what exactly do I mean by the term "Look-up". 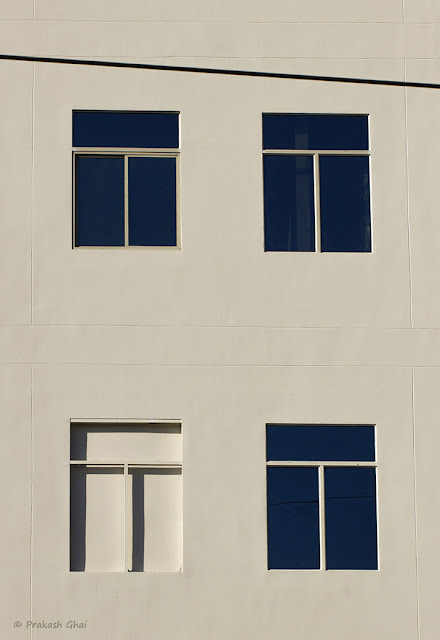 To subject, i.e the Four Windows in Repetition on the creamy wall, was pretty far away from me and I was standing right across the road. To shoot such long range Minimalist Photos, one needs a Telephoto Lens. My Canon 100mm prime IS USM L Macro Lens (affiliate link) works pretty well for me, for this purpose. It fits quite nicely on my Canon T3i Rebel or 600D Camera, and delivers some nice sharp photos. Since my camera is a Crop Frame Camera rather than a Full-frame, the range of coverage of my Macro Lens increases from 100mm to 160mm. You can also use a Zoom Lens for such shots, but mind you, the moment you zoom in you start losing quality. I prefer prime lenses. Of course, they are expensive and then you need to have many of them to cover different ranges. But, the quality speaks for itself and you save a lot of time on post-processing. "The more you shoot with prime lenses, the less time you spend in Photoshop editing photos." The unfinished ODD ONE OUT Window caught my eye, along with those 3 Beautiful Rectangles in each of those windows. I first planed to shoot this from the side, in the landscape mode. But that was not doing justice to the composition. So, I decided to walk right in front of the building and shot Vertically or in the Portrait mode. Now, the frame looked balanced. I was standing across the road and there were many High-tension electricity wires above me. The black wire that you see on the top slanting towards the right, is one of those wires. I planned to omit this wire at first, but later I felt, that it would be better to add it to the frame rather than exclude it. Hope you liked my little effort on the photograph. If you have any comments or views on it, please leave them below. This photo looks good with the electric wire. It adds one more shape (line) and some extra color to the picture.